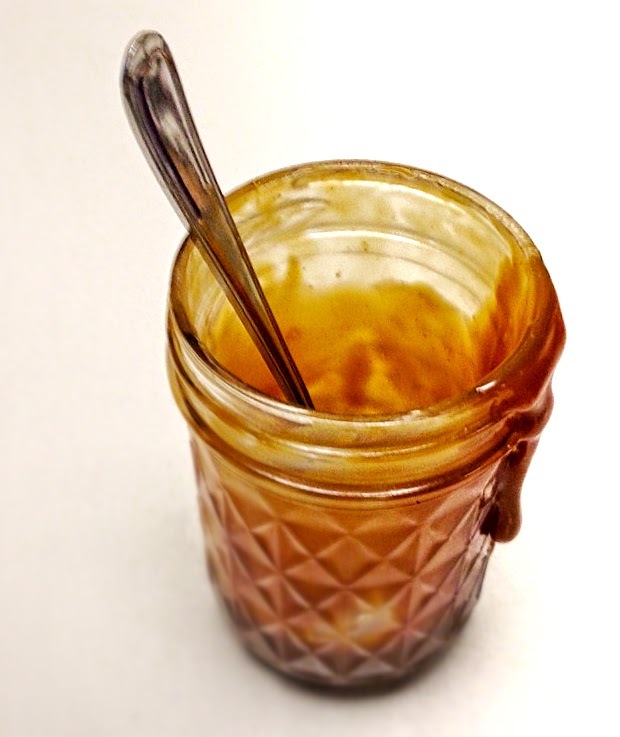 Easy Caramel Sauce + TWO Giveaway Winners Announced! Congratulations to Alexandra & Carla for winning our giveway! A very warm thanks to everyone who participated. Stay tuned for our upcoming giveaway. Nutella just met its match. I have created a monster which has me shamelessly sneaking spoonfuls all day and I just cannot stop. Consider yourself warned. The same thing could happen to you. I still have to fight the urge to polish off a whole jar of that chocolaty goodness from Italy, but I’d like to think my taste is more refined these days. Caramel has now taken the spotlight and my goal has been to perfect a recipe for homemade sauce. Working with sugar can be tricky. What happens after it cools depends entirely on how much heat was applied. For years, I have been an expert at making toffee, but getting that gorgeous, shiny caramel that flows off the top of a slice of cake has been a challenge, until now. Grandma’s toffee went through a bit of a transformation and became a silky smooth, insanely delicious butter caramel sauce with an ever-so-slight hint of salt. Slap some of this stuff onto an old pair of sea captain’s boots and you can serve them for dessert. Salt is crucial to sugar, because it tames the sweetness. This is especially true of caramel. The amount of salt differs dramatically depending on the origin and form of salt used. A teeny teaspoon of good old Morton’s packs a lot more flavor than delicate sea salt. Also, coarse crystals and flakes will not dissolve into the caramel as readily as fine ground. This is not necessarily a bad thing, though, especially if you enjoy a surprising punch of salt in your caramel. 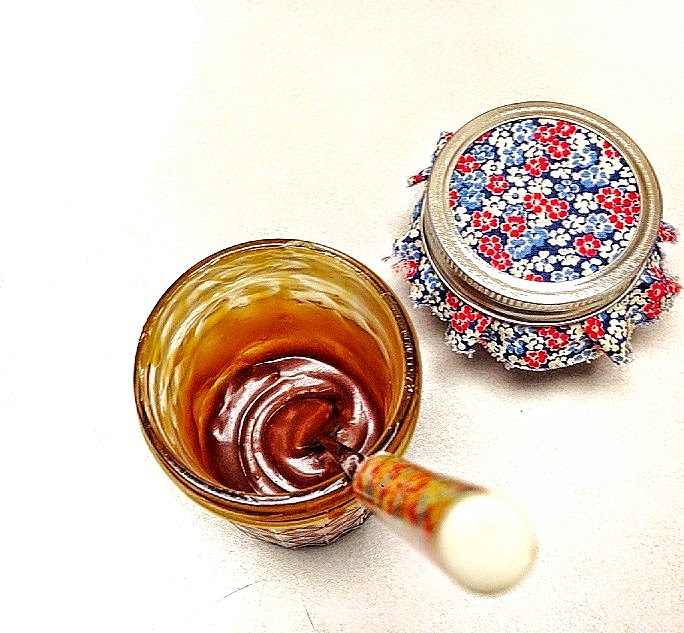 With Christmas just around the corner, these sweet jars of homemade caramel sauce make perfect gifts for those I love. The ingredients are so simple. Everything you need is already in your fridge and pantry. 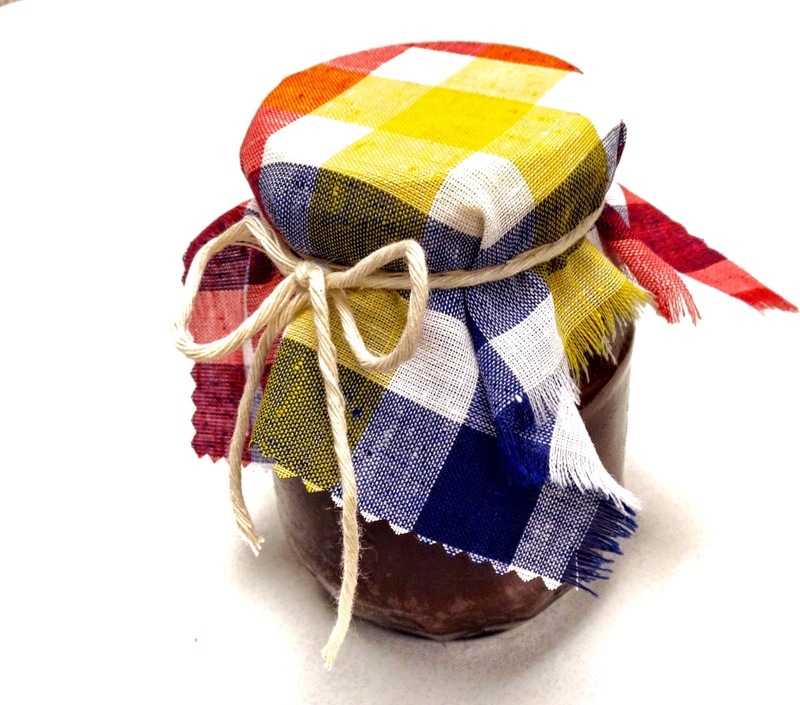 Stock up on little jars, some old fabric, twine and a pair of pinking shears to make the prettiest little personalized gifts that are sure to make everyone on your list smile with delight. I remember the first time I made this sweet delight. I have a habit of flipping through food magazines at bedtime. A photo of Clodagh McKenna’s buttery bread pudding had been doing cartwheels in my mind all night and I woke up early, hell-bent on making it for my family. It was a rainy Sunday morning, perfect for a cozy breakfast. While the pudding was in the oven, I started making the caramel sauce. I literally threw everything into the pot and brought it to a bubbling boil. It was the first thing to go on the table, before I added plates, napkins and such. Every time I walked through the dining room on my way into the kitchen, I caught a whiff of that sweet, brown butter and I swear my knees almost gave out. I hadn’t even tasted it yet, but I knew I had a winner. Sugar changes dramatically (and irreversibly) depending on how much heat is applied to it. Heat it past a certain point and it will solidify after it cools. There is a perfect temperature threshold where the sugar melts and cooks into a toasty color and flavor, but promises to stay liquid after it chills. Getting there is the trick.. Once the sugar mixture has liquified and turned a deep amber color, it’s time to take it off the heat. A candy thermometer obliterates the guesswork from identifying that perfect stage and guarantees consistent results in the home kitchen. But, enter the giveaway below and I will buy a candy thermometer for TWO of you. This giveaway is open to my international friends. Hurry and enter before Friday October 23rd. Notes: As with anything made with sugar, take extra precautions to protect children, pets and yourself from nasty burns. Set the pot on a burner farthest from the edge, away from little hands and heat it very slowly. Toward the end, the temperature will rise rather suddenly and the molten sugar will smoke and burn. Keep a watchful eye on the pot at all times. 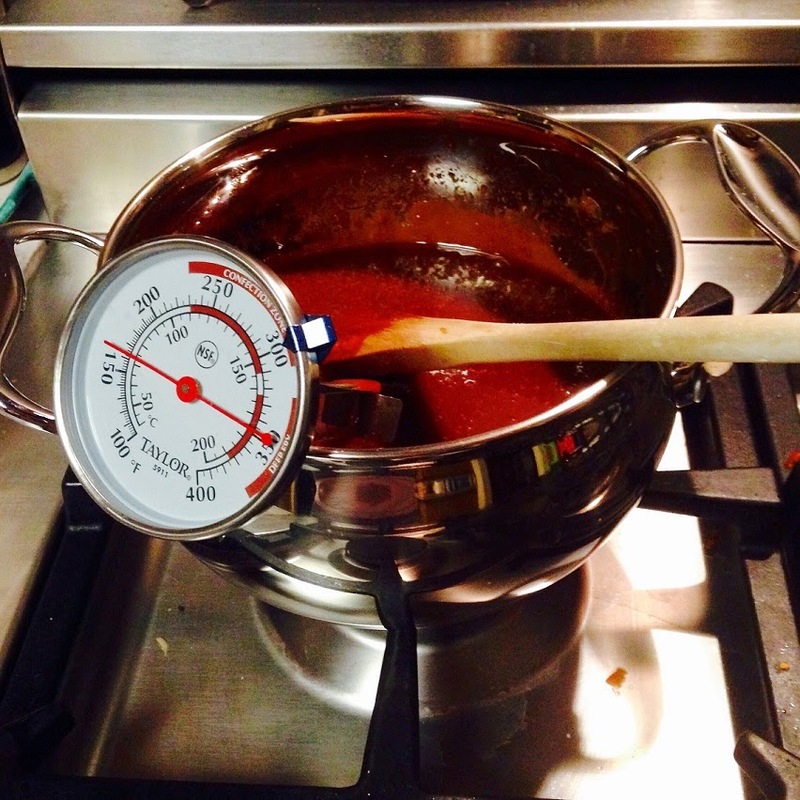 Clip a candy thermometer, if using, to the side of a heavy-bottomed pot. Add butter, sugar and salt to the pot and place it over medium heat at the back of the stove. Use a wooden spoon to stir just until the butter and sugar have dissolved. Lower the heat a bit and let the mixture slowly bubble away, just until the candy thermometer registers 310*F.
Be careful as this is when the sugar will start to smoke and quickly burn. The mixture should be quite fluid and a rich, dark amber. Remove from the heat. Stir vigorously and very slowly stream the heavy cream into the hot sugar mixture. Finish with the vanilla and set the caramel aside to cool. Divide among jars and decorate with pretty bows and such. Store in the fridge for 2-3 weeks. 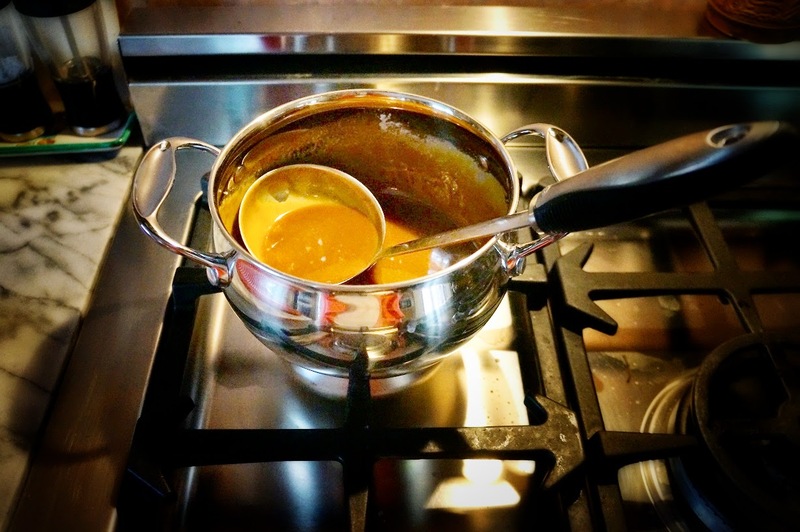 Caramel sauce is a luxurious, decadent addition to anything sweet, but adventurous foodies know it has earned a slot on the ingredients list of a few savory dishes hailing from Trinidad and Vietnam. Savory or sweet, the choice is yours. Whatever you decide, make the sauce first. Worry about what you will do with it later. Do all the usual things, like drizzling it over ice cream or over warm bread pudding fresh out of the oven on Sunday morning. Ditch the usual cream and sugar. Put this caramel sauce into your morning coffee, or better yet, into your evening coffee for a treat before bedtime. Not a coffee connoisseur? It’s lovely in tea, too. 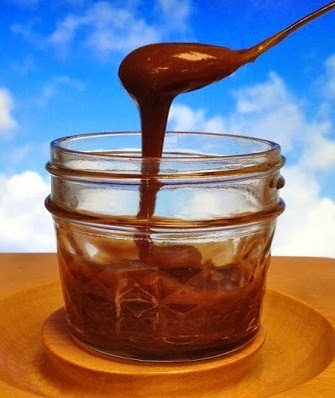 And, don’t forget to enter the giveaway to win your own candy thermometer so you can make this luscious caramel sauce. If you absolutely cannot help just eating it by the spoonful right out of the jar, I won’t be telling anyone. This looks delicious 🙂 Perfect for fall desserts. I totally am crossing my fingers for a candy thermometer because mine bit the dust and I love making fudges and candies for the holidays! I would use this carmel sauce in my coffee 🙂 ok and on. some apple crisp! Hi Coco, caramel is something that I always have a hard time with. Love this sauce. Dear Colette, there is no such thing as having too many incredibly delicious dessert sauce recipes – your caramel sauce looks like a wonderful treat to be enjoyed just as is or as a topping for some great quality vanilla ice cream or with homemade rice pudding…now I am getting hungry again and would nor mind some lovely dessert with some of your fabulous sauce. Hope that all is well and sending you many hugs from afar, dear friend. I would pour it on apples or pour it on angel food cake. It is superb in coffee! You'll love this recipe, Cheri. You can make it with your eyes closed and it'll turn out perfectly. I can just imagine how good your caramel sauce was on the warm bread pudding. You really know how to start the day with something decadent and delicious.